The result against Wolves has made this game bigger and tougher than it should have been as there will now be an added pressure on the Gunners. Liverpool’s win over Newcastle has also put them above Arsenal in fifth and only a win will see Arsenal climb over the Reds. Arsenal’s margin of error was miniscule after the poor start to the season but it’s almost vanished now. The reason I’m stressing on the importance of this game is to underline the need for getting the tactics and starting eleven for this game spot on. Ideally, one would want a lot of rotation when there are two games in three days but I don’t know how Wenger will balance the risk of injury with that of dropping points. Then again he gets paid to deal with such issues and so he must. I get a feeling Ramsey and Walcott will be restored to the starting eleven. It will be interesting to see if Rosicky and Benayoun make way or Wenger chooses to rest some other players. In my opinion, Arteta deserves a rest and Arsenal must also show they can play without the Spaniard’s technique and work-rate. I’d also like to see Benayoun retained in his starting position. Gervinho can take a break on the left. In the previous game, when the Israeli international drifted in from the right, Djourou wasn’t really able to provide the width. There is a good chance Vermaelen can offer more on the left. Chamakh for Van Persie is another option that Arsene will probably have to consider depending on the fitness levels. I feel it’s better to give Van Persie an hour. He can be given a break if the team is up by a couple of goals around the hour mark. In that case, Arteta could come on to provide extra composure in the middle and Chamakh could provide a target for receiving and holding the balls. There is also an argument to drop Song back into the defence and give one of the defenders a breather as they’ve been playing incessantly. Miquel or Coquelin could also be brought in at one of the full-back positions (although playing both will be too big a risk). These are the kind of changes that Ferguson is able to make at United, especially at home, without losing out on too many points, but Arsene hasn’t really made such decisions often enough and the side has struggled at times when such make-shift arrangements have been forced by injuries. Szczesny – Djourou, Mertesacker, Koscielny, Vermaelen – Song, Rosicky, Ramsey – Walcott, RvP, Benayoun. I am going with this line-up as another poor result at home at this stage will be a massive dent in Arsenal’s top four ambitions. It’s important to keep the defence solid, or as solid as possible. Wenger will probably have to stretch his players over the next two games but then he can give some of them a good rest as the only fixture between the visits to Fulham on 2nd Jan and Swansea on 15th is a FA Cup tie at home against Leeds. A number of youngsters could feature in that game giving their senior pros a well-deserved respite. In such cases, when picking the starting line-up seems to lack clear-cut choices and despite the unquestionable need for getting it right, I prefer to give Wenger the benefit of the doubt with his selections. He will balance the factors as well as he can and we can only hope it works out well. It will also be interesting to see how QPR play this one. They have a number of fairly talented players who have been misfits at most clubs they’ve been at. For instance, Shaun-Wright Phillips is a quick, tricky winger and you wouldn’t be surprised if he dribbled past two or three defensive players before smashing one in from 25 yards. He’s erratic and makes mistakes more often than he produces magical moments, but Arsenal do have a tendency to conceded from a solitary shot on goal and a freakish one at that. Similarly, a guy like Helguson does have a tendency to score goals, often headed ones like the Fletcher goal we saw in the last game, or the kind that Yakubu scored earlier in the season. Traore has pace and can occasionally whip in very good crosses. I am not saying these are major perils that Arsenal should be worried about but just highlighting the likely sources of freakish goals. Then there is Joey Barton. Last season his tackle on Diaby, and general physical approach in that game, played a part (how big is anyone’s guess) in unravelling Arsenal’s season. This year he cost the Gunners two red cards in the opening game that have proven to be very expensive on the points table. Not only are his theatrics and tactical baiting a problem area for the Gunners, his delivery into the box can be a weapon for a side that is strong in the air. Arsenal need a lot more poise and maturity on the pitch to reduce the odds of conceding mind-boggling goals or balance-destroying cards. They must also make more purposeful challenges for loose balls in and around the box. Of course the best way to move beyond these issues is to go out, dominate the game, and take some of the chances that are bound to come against such a side at home. Traore could probably come close to Walcott for pace than most defenders would but his positioning and decision making are suspect. Arsenal can create a number of gilt-edged chances from the right in this game. We should also see the Gunners build on the impressive chipped passes we saw in the previous game, especially if QPR try to push up. In general, the visitors’ back four isn’t the sharpest and I will be disappointed if Arsenal don’t trouble them consistently. I won’t be able to watch this game as I am flying for most of the day tomorrow for the start of a week long holiday. The match report will be delayed by a day or so and I am not sure if I will get the time to write about the Fulham game. Normal service should resume with the Leeds FA Cup tie. To get instant updates about new posts you can either subscribe to the blog by email or join me on twitter. I think everyone, including Wenger, is aware that Arsenal need to bolster the squad in the upcoming transfer window. Few agree on the exact details but defence and striker appear to be two positions where most would want reinforcements. I was thinking about the possibilities while looking at the current squad and it seems like a very complicated situation for the Gunners. To start with we need to keep the 25 player limit and the home-grown quota requirement in mind. Based on the details of that rule, I compiled the following table for the current squad. The names in black font are players who are neither home-grown, nor U21. Arsenal already have the maximum possible 17 players under this quota. As a consequence, in order to accommodate any non-English experienced (above 21 years) player, Arsenal will have to leave someone from this list out. Almunia and Squillaci seem like the obvious candidates for the drop. I can’t see anyone else being left out. I am not completely sure about Diaby’s status as a home-grown player but it’s likely that he doesn’t qualify. In effect, if Arsenal have to sign a striker they will have to leave Almunia out. Squillaci can probably be replaced by a defensive signing. Although given the current state of injuries at the back, I am not sure leaving the Frenchman out is a wise choice. There is also a concern over the fitness issues of Mannone and Fabianski so there might be an argument for having four goalkeepers in the squad. Of course “anyone but Almunia” remains the popular mantra so he should be the first to get the chop. There might be some rule for getting an emergency signing if all three goalkeepers are injured. I don’t have the details about that but other clubs have done something similar. So it would be safe to say Arsenal can get one experienced player in at the expense of the hapless Spanish custodian. But for that to happen he will either have to go on loan, or be sold, or be left out of the list despite being on the club’s payroll. I strongly feel the Gunners should explore the first two options but if it doesn’t work out they should ruthlessly leave him out. I don’t hate the guy as some seem to do and will find such a move harsh but it is also inarguably necessary. With that free spot Wenger can only bring one player in. That can be a striker, a winger, a midfielder, or a utility player. I will return to the possible choices a little later. The other option for Arsenal is to sign a player to replace Squillaci or someone who can qualify as home-grown. 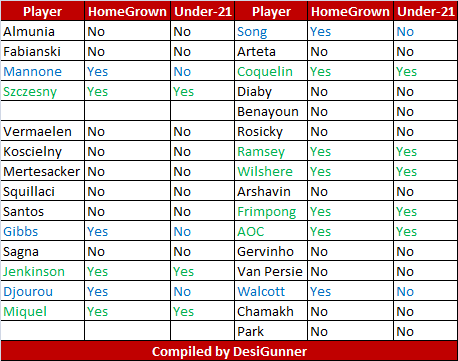 Apart from the 17 “Foreign” players, each team can have 8 players above the age of 21 who are home-grown (trained at an English or Welsh club for at least three years between the ages of 16 and 21). The players listed in the blue font currently fall under this category and the Gunners only have 5 such players. Those listed in Green can be included in the U-21 list for the current season and can play without being part of the squad of 25. Arsenal’s youth strength is obvious from that list but it’s worth noting that Ramsey and Szczesny will move past the 21 year limit next season so the squad will have to maintain some room for them. In essence, the Gunners can safely buy one English (Welsh or foreigner trained in England) player and supplement the squad with up to two additional acquisitions to replace Almunia and Squillaci. There are other options like selling Arshavin and/or Chamakh but I think these will just complicate things further and in themselves will not be as easy to execute in January, particularly in a manner that would give Wenger the time to sign a replacement. Arsene has to balance these equations with the short-term and long-term in mind. For instance, bringing someone like Henry on loan at the moment can work for a couple of months but will leave a hole in the squad for the rest of the season. Players like Park and Oxlade-Chamberlain might step up by that time or might not. It’s hard to guess. Given the constraints, it’s also hard to visualize two players like Podolski and Henry being signed. Le Boss could go for the audacious and buy a prodigy like Eden Hazard (and loan him back for the rest of the year) for the next season to go with a short-term loan for the Arsenal legend. Personally speaking, a striker is more important than a wide attacker. And in order to fit into the Arsenal style the striker would have to be comfortable with his back to the goal. There aren’t many who can do that. For instance, Podolski is a very good player – someone I have always seen as RvP Lite – but I am not sure he can play as a central striker in Wenger’s current tactical system. Among the other names that I have read and are realistically possible, none is particularly exciting. It’s also important to remember the difference in the quality between various leagues across Europe. Lille were desperate to sign Ju-Young Park but he isn’t getting many games at Arsenal, not even making the bench for some. Gervinho was a lot more effective in France than he has been for the Gunners. So the likelihood of getting a top class striker who can make an immediate impact is very low even if many are hyped up in the relatively weaker leagues. This makes the return of King Henry a very real possibility but again I am not sure he has the speed or the work-rate to contribute at this level consistently. Nonetheless, he could be a good player to have on the bench and for the cup-ties. This should relieve the burden on Van Persie to a great extent. Will Henry be able to accept a bit-part role is the bigger question. He cannot bring the attitude we saw in his last season – pointing at his feet and demanding the ball, angry glares at teammates – to the ground anymore. But all things considered, TH14 seems to be the best bet. As an interesting side issue, what number would Henry take if he did return? I say 41 will be apt for a comeback. Moving to other positions, I don’t see how Arsenal can sign a creative midfielder or winger to go with the striker without severely compromising the defence. That would explain the excuse that Wenger has given regarding the Gourcuff signing. He mentioned the return of Diaby and Wilshere but I don’t think that is the real argument. Suppose, just for the sake of argument, Fabregas wanted to come back this January – Do you think Arsene would have said I can’t sign him because our midfield would be too crowded? No way! So citing the returning players is just a ruse that Le Boss has used to deflect the issue. Sadly, many have taken his words literally, but I don’t blame him for not being forthright about such issues. Do you really expect him to say something like, “Well Gourcuff is returning from a long injury layoff and isn’t in top form, and we don’t have the space in the squad to accommodate a player who will need time to get back on track”? As an extension of that, I don’t see a player like Goetze coming to Arsenal this January. Although it would still be interesting to see if Wenger bids for the young German. For a talent like that Le Boss might just decide it’s worth leaving the striker out. But it doesn’t seem realistic at this juncture. That brings us to the defence and I include defensive midfield in that. For close to two years I have held the opinion that the Arsenal squad needs at least one more versatile defensive player of very high quality. The current injury crisis has only strengthened this belief. Someone like Jan Vertonghen ticks a number of boxes as he can play LB, CB or even in midfield. But in order to secure the services of a foreign player, Arsenal will have to make space in the squad. While removing Squillaci and adding a player like Vertonghen will certainly improve the quality of the squad, I am not convinced that will give Arsenal sufficient depth to cope with the hectic schedules ahead. Let’s not forget players returning from long layoffs are likely to suffer at least some niggling injuries on their way back. So even when the fullbacks return, it would be naive to assume they won’t face further fitness related problems. The best way to solve this conundrum would be to add a home-grown defensive player to the squad. I am not a big fan of players like Cahill, Baines, Jagielka, and the likes but they can be useful squad members and Wenger has the ability to get more out of them. Essentially, Le Boss will have to find some value in the local market in defence or defensive midfield. Otherwise adding depth will be a tough ask. Arsenal might get lucky with injuries and manage with one or no acquisitions but the current league position is too precarious to take such a risk. Part of this analysis has been under the assumption that Arsenal can either sell, loan, or leave out players like Almunia and Squillaci. I don’t know if the rules permit having a player on the payroll but leaving him out of the roster of 25. If they don’t, Arsenal will have to find new clubs for these players before making any signings. The activities in the winter window will also affect Arsenal’s options in the summer but at that time Wenger will have more time and will be better placed to decide on the futures of players like Chamakh, Arshavin, and some others along with those who are currently on loan. Apart from the aspects discussed thus far, certain basic factors will have to fall in place for any transfer to be completed – Wenger should rate the player highly enough to want him, the player must be interested in playing for Arsenal, his wage demands have to fit the Arsenal structure, and his club should be willing to do business at a price Arsenal can afford. Other issues like being cup-tied can also have an impact on any likely deal. All-in-all this is clearly a complicated period for the Gunners and Wenger will have his task cut out. One can only hope Le Boss is more decisive than he was during the summer but it’s not hard to see his difficulties. These transfer issues are not as simple as sell X, Y, Z and buy A, B, C. But I will be worried about the top four spot if Wenger cannot perform the right balancing act in January. I started this post around midnight and haven’t been able to double check the details so apologies in advance for any errors. The second half onslaught was exhilarating but not quite enough to regain the two points that another freakish goal had taken away. Arsene did rotate some of the players. Djourou came in for Coquelin, Rosicky for Ramsey, and Benayoun for Walcott. It was a strong team and one that should have secured the win with relative ease. The first half was disappointing to say the least. Arsenal virtually had monopoly over the ball but most of the possession was ten yards either side of the centre line as Wolves got into a good defensive shape to cover the passing channels while marking the players getting into attacking positions. Nevertheless, the Gunners had enough opportunities to score two or three goals. The fact that most of these chances didn’t even result in a shot on target said a lot. Arsenal lacked cohesion and understanding in the attacking areas. Part of it was down to the fact that two players hadn’t played often enough, then there was Van Persie who seemed a little too selfish in this game – uncharacteristically one must add, and the decision making from the man in position to play the final ball was either slow or just poor. The early goal might also have worked against Arsenal in this case as the players became a touch casual, losing balls in midfield and allowing Wolves sufficient opportunities to get to the final third. There is a fine line between a patient yet probing possession game and a laid-back, toothless tippy-tappy approach. The Gunners were on the wrong side of that line, only just but it proved decisive. Arsenal’s goal came in the 8th minute from a quick counter attack. Rosicky controlled a looping ball just outside the box and did well to accelerate across the halfway line. At that point, lacking the pace of Walcott or Gervinho, Little Mozart turned around to shrug off the attentions of two Wolves. Benayoun received a square pass from Rosicky and quickly thread one through to Gervinho who’d sped down the middle. The Ivorian beat the keeper by flicking the ball to his left in a somewhat unorthodox manner but that allowed him the chance to roll the ball into an open net so it should be considered a neat trick. Apart from the goal, the only other noteworthy save came in the 30th minute from a Van Persie strike at the near post. Arteta’s tame free-kick, Rosicky chancing his luck from distance, and Vermaelen’s blocked attempt can’t really be classed as good chances. The trouble for Arsenal in the first half was that Wolves were able to get to the final third with ease almost every time they regained possession. The midfield pressing wasn’t very good and the team couldn’t regain the right shape soon enough after losing the ball. For the visitors it was mostly about putting the ball in the box and hoping for a lucky break. Arsenal’s defence-by-crowd tactic was working for most parts – as indeed it did for Wolves at the end – but there was always the chance of one freakish goal. Interestingly, the equalizer too came from a player controlling a falling ball on the edge of the Arsenal box. This time it was Hunt who brought it under control and unleashed a hopeful shot that was deflected towards Fletcher by a charging defender. On almost every other occasion this ball would have deflected to safety or for a corner that Arsenal could defend. in this case though, it fell invitingly on the head of the Wolves striker who deserves credit for calmly guiding it into the corner. Questions can be asked about Mertesacker’s positioning as he was marking the goal-scorer but I think it’s hard for defenders to read such deflections. The German was tucking in and keeping things compact in front of the goal, which seems to be the tactical approach anyway. The second half was a different story as Arsenal slowly but surely showed more purpose. The Gunners had 19 shots in the second half compared to 7 in the first with 12 of those coming in the final fifteen minutes plus added time. There were a number of positives for those taking an optimistic viewpoint. Arsenal got sufficient bodies into the box. The crosses weren’t all completely meaningless as they did lead to chances and occasionally caused havoc in the penalty area. The substitutes made an impact. The overall tempo of the game was raised and the players also showed a lot better coordination. A number of accurate chipped passes were very encouraging from a technical and understanding point of view. Corners had some variations and weren’t easily cleared away. Hennessey was forced into action regularly and might just walk away with the MotM. There is usually some consolation when the opposition Keeper looks like their best player on the pitch but it is rarely enough to mask the frustration of the result. On the negative side, apart from the obvious issues in the first half, I thought Arsenal lacked a bit of maturity in the attacking areas towards the end. There were really no attempts to play combinations in the box from the crosses. The crosses were being put in and any player getting on the end of it was trying to direct it towards goal. While the general crossing and attacking the ball was an improvement over many past efforts, one gets the feeling there was a goal to be had if the Gunners had shown better awareness inside the box. Given the fact that Arsenal got a man advantage after the red card in the 75th minute, the number of chances was understandable but more is expected from a team looking to capitalize on the points dropped by their rivals. In my opinion, an interesting, crucial and somewhat worrying factor was that too many players had a mixed bag in this game. More on this in the player analysis. The stats show Arsenal had complete dominance over this game. Possession 73-27, Shots 26-6, On Target 11 – 1, Clearances 15-49, Tackles 34/47 – 17/38. But the only figure that mattered at the end was 1-1 on the score-sheet and consequently, the points table. Szczesny: Didn’t have much to do. Couldn’t really have done much for the goal. Those talking about communication and organization skills of the Keeper might want to explain why the freak goals keep on coming. Djourou: I liked his desire to do something with the ball but he didn’t really know what to do with it once he got into advanced areas. Fairly stable defensively and made a couple of good tackles. Also won 7 of his 11 ground duels and both his aerial duels. Made the most clearances. Mertesacker: A harsh critic might blame him partially for the goal. I thought he had an excellent game starting with a big block early on. His positioning was excellent as was his reading of the game. Won all his duels, 5 on the ground and 3 in the air, apart from winning a number of headers that contributed to the 5 times he won back possession in the defensive third and thrice in the middle third. Forced a good save from a header at the back post, could have done better to attack a Gervinho cross. Koscielny: Once again made the most passes and most accurate ones, with the second highest touches as Arsenal played around at the back quite often. Was involved in fewer duels and tackles – four in total with a 50 percent success rate. Made a couple of promising attacking runs. Won back possession six times – most often – in the defensive third. Vermaelen: Produced a battling display on the left with a vastly improved attacking effort. Had a couple of shots at goal – one blocked and one saved late in the game. Won 5 of his 8 duels and the only tackle he made. The defenders had a good game despite not keeping a clean sheet. The number of freakish goals conceded by Arsenal is a clear indication of structural issues that lead to more opportunities for the opponents. As I have said for close to two years now, personnel changes on the field is not enough for solving this. Song: I got a feeling he was a touch casual with his passing and movement in the first half. Had the most unsuccessful touches in the side, which looks even worse when seen as a proportion of total touches (5/69). Lost the only ground duel he contested and didn’t have any aerial duels or tackles, which was surprising. He did win possession back in midfield thrice. Could easily have seen two yellow cards for successive rash tackles within a moment of each other. Disappointing on the whole. Rosicky: Played a key part in the first goal. Also created 4 chances. Was third highest in terms of passes but also lost possession most often, largely due to the fact that majority of his passes came in the attacking half/final third. Rosicky’s 43 attempted passes in the FT was almost double the next best 26 by Arteta. He also put in a good defensive shift. Little Mozart had a very good game but there were moments when he could have done much more in or around the box, especially in the first half. Arteta: Once again had the highest number of touches (0 out of 102 unsuccessful!) and was instrumental in keeping the ball when under pressure. Got back into defensive positions whenever needed. Also won possession back most often – 4 – in midfield. Won all three tackles and four of his five ground duels. Created 4 chances – 2 from open play and 2 from set-pieces. The midfield saw a lot of the ball and was generally comfortable in possession but one would expect more when a win is a must. Song had a mixed bag as he seemed a fraction off pace. Rosicky was very, very good for most of the game but there were moments when he could have played a better ball, shown greater control, or been more decisive. It’s unfair to nit-pick but the difference between one point and three in such games is usually in the little details. Benayoun: Excellent assist, and made a number of intelligent runs but lacked pace or control at vital moment in the attacking third. Drifted in regularly but wasn’t able to shrug off his marker. That meant he had the lowest touches/min ratio of all the outfield players except Chamakh. Should have been more involved and done better on the ball in the final third. Van Persie: Forced 5 good saves but the 12 total shots indicate a degree of selfishness. He also missed a couple of glorious chances when his touch let him down after being put through by delightful chipped passes. Work rate was excellent as usual and took a number of rough challenges in his stride. Could very well be that the record was playing on his mind and ended up putting De Kapitein off his game by his standards. Gervinho: Took his goal really well. Made a number of good runs with the ball but wasn’t able to beat his man effectively and was successful with only 1 out of 4 dribble attempts. Wasn’t really getting into the right positions often enough either. All three attacking players had an on and off game. Benayoun got the assist and Gervinho the goal but both should have offered a lot more in terms of movement, availability to receive passes, and quality on the ball. Van Persie was probably trying too hard. Subs: Arshavin had a very good game and contributed creatively in the limited time he got. Created the chance for Vermaelen, could have had the pre-assist with his quick thinking for the Mertesacker header as he found Rosicky with an early pass, played Ramsey through, and almost scored from a wonder-strike that went inches wide. Chamakh didn’t see much of the ball, which was disappointing. More crosses should have been aimed at him. Ramsey completed all passes from open play and only failed with a couple of crosses out of six attempts. Rambo also created the game high 6 chances in the limited minutes that he got! Wenger: Team selection was justified. The decision to bring on Arshavin was probably not the popular one but was the correct one. Did well to take Song off as the Cameroonian was losing his cool. Should he have introduced Chamakh the moment Arsenal went a man up? Crossing and set-piece routines have improved and Arsenal did get a lot of bodies into the box but a lot more needs to be done. Largely at fault for the goal as his defence-by-crowd tactic doesn’t always work. It would be harsh to ignore the positives but Arsenal do drop more points in such games than teams that are genuinely challenging for the title. This Boxing Day was a great one for Arsenal and a fun time for me. Hope you had a joyful Christmas too. Apologies for the lateness of this post but the whole weekend was just so enjoyable and engaging, I couldn’t find any time before now. Well, I did find some time but then Sachin came on to bat and took up the best part of the last two hours. Siddle did finally produced a quality spell and deservedly took the little master’s wicket. I can now forget about this Test, till Tendulkar’s second innings at least. Wolverhampton Wanderers visit the Emirates in a game delayed by a day. This has given Arsenal the cushion of knowing a win can put them firmly in the top four and a big one (5 goals, or is it 6) will see the Gunners climb up to 3rd, at least temporarily. Wolves have not won against Arsenal in the Premier League in six attempts. Much like United were against Wigan, Wenger’s side will be odds on favourites for this one. But that doesn’t always work out. On Monday, West Brom did manage to take their first Premier League point off Chelsea on their 12th attempt to present the Gunners an opportunity to move into the Champions League places. And just as we saw against Fulham a bit earlier in the season, a below par performance can prove to be costly at this level. That said, I will be surprised and disappointed if Arsene does not rotate his squad around during the next three games that will be played in the course of seven days. The injury situation will make that task tougher but Wenger just cannot field his best players in all the games. At the back I would not like to see any changes for this game. Coquelin deserves another game. Vermaelen should continue at left-back with Mertesacker and Koscielny in defence. I think the young Frenchman will have to bring some versatility to his game in order to make a big career at Arsenal. The current injury woes have given him a chance he’d do well to grab with both hands, or feet. In the midfield, Song should come back alongside Arteta but I’d like to see Rosicky, if fit, replace Ramsey, who deserves a breather. Up front, either Gervinho or Walcott can be rested with Benayoun coming into the starting eleven. Szczesny – Coquelin, Mertesacker, Koscielny, Vermaelen – Song, Rosicky, Arteta – Walcott, RvP, Benayoun. This won’t be Arsenal’s strongest line-up from the players available but the Gunners just have to learn to pick up points consistently even while resting regular starters. Depending on the performances and result of this game, as well as the fitness levels, Arsene could then rest some of the other players in the next game. Unfortunately, there aren’t many options at the back so it will be hard for the defenders to get many breaks, which of course can then compromise their own long-term fitness. It will be a stroke of genius if Arsene can find a way to give his defenders some time off. Playing Song at the back, an early return for Djourou, a big risk with Squillaci, and another chance for Miquel are all options Le Boss can explore (certainly not all at once) but none of them is particularly exciting at this moment. Coming to tactics, this game should be routine for Arsenal. Wolves have not kept a clean sheet in 14 League games and I can’t see them keeping the Gunners out unless the tempo drops considerably. For Arsenal it’s just about moving the ball around at their usual high pace, probing, and waiting for opportunities to score. There should be plenty of openings and Van Persie should get good chances to equal Shearer’s record. Rosicky and Benayoun haven’t played many games this season so the changes suggested, or any that Wenger actually makes, could prove to be risky. Nevertheless, teams vying for top honours need to know how to override such perils without too much of a fuss. Subtle adjustments might be needed if one of the pacy wingers is not in the starting line-up. The regular wide attacker that starts will have to make a significantly higher number of central runs to get into spaces vacated by Van Persie. Rosicky and Benayoun can both provide the creative ability to thread a ball though and individual technique to get the better of their marker, but neither will have the pace to take on defenders in order to get in behind on a regular basis. We might also see more combination play around the box if an extra technical player is picked on the wings. The final ball and finish at the end of all that passing must not lack that fraction of quality that differentiates teams at this level. In defence, Arsenal will again have the usual threat of wing-play, counter-attacks, and aerial bombardment. The collective defence is strong enough to deal with it but individual mistakes just have to be cut out. Wolves do press well on occasions but I am not sure they will be able to do that successfully in an away game to Arsenal. After copping a great deal of flak for their overly physical play at the start of last season, Mick McCarthy’s side has also started playing better with the ball on the ground. That hasn’t worked out so well for them but I like their efforts and wish them well in their bid for Premiership survival. Hopefully, this game won’t see them regress to their earlier approach or boost their chances for avoiding relegation. Here’s to a clean game where Arsenal can show they have the depth needed to capitalize on the points dropped by the big-spending rivals. In an unrelated matter, in case you haven’t had the chance to see it yet, here is a stat-based analysis/comparison of the performances of Scott Parker and Denilson that I did for Epl Index. I think it’s safe to say the overhyped Englishman is not good enough for Arsenal. What a result! Tough game, battling performance, well-earned points. Not vintage but victorious nonetheless. I was surprised to see Coquelin in the starting line-up at Right Back as Arsene has said in the past the youngster doesn’t isn’t suited to the role. Perhaps it was due to Miquel’s errors at City. Did Wenger expect N’Zogbia to play on the left and feel the Spaniard would struggle against him? Whatever the reason, Arsenal had two young players in defensive positions and that gave Villa a good chance. In the first half, the Gunners controlled a lot of the ball but most of the attacking moves were coming from the hosts. A number of balls flashed across the Arsenal box as the visitors struggled to defend their flanks. But the fact that Villa didn’t have any other attacking options except this ultra-low percentage wing-play meant that Szczesny wasn’t seriously troubled in goal. Only one save from a header from Agbonlahor comes to mind. Arsenal’s defence also deserves credit for their tackling/pressure in the box which meant Villa didn’t get any free shots on goal. For instance, Ramsey did superbly to thwart Agbonlahor in the 11th minute when the hosts broke forward from an Arsenal corner. There were a number of other blocks/clearances/interceptions from the Gunners that protected Szczesny and the goal behind him. Tactically, Arsenal were struggling to cover the flanks and the overall defensive shape wasn’t very good but the players made it harder for the hosts in front of goal. Arsenal’s opener came against the run of play to an extent. Villa’s goal hadn’t been threatened by the 17th minute. Walcott deserves credit for his quick thinking and nifty footwork that allowed him to beat Clark and get into the box. The Villa midfielder pulled Theo back quite blatantly and there could be no arguments about the penalty that Van Persie smashed high into the net. A minute later Arsenal had another great chance as De Kapitein put Theo through. Walcott’s early lob was deflected away by the onrushing Keeper’s shoulder. That was the first time the Gunners got in behind Villa who were playing a relatively high line. After the goal Villa pushed forward but their goal-threat was limited to crosses and shots from distance. Wenger’s men were holding firm. At the other end Arsenal got a couple of excellent chances but Ramsey produced a disappointing finish and a poor through-ball. First, in the 32nd minute, one-touch play from Gervinho and RvP, put Ramsey clear on goal. Dunne was coming in to tackle and Walcott was free on the right. The Welshman went for power but skewed it wide. I thought it was a very tough shot to execute as he was running at full pelt and had to stretch in the final stride to get the shot away. A better choice might have been to play it towards Theo or even to take a touch as Dunne was the only defender near him. At such a pace though, it’s tough to criticize the player as we see such misses all the time. Of course, that doesn’t mean one cannot expect better. The other miss came from an overhit pass from Ramsey when Gervinho would have been clean through if the ball had the right weight. Again I thought the youngster rushed his pass as he was under pressure. Arsenal went into the break ahead but you could see Villa were in with a chance as they were getting into dangerous positions. The hosts started the second half with a higher press and put Wenger’s side under pressure. Song was being sorely missed but Arsenal were holding on. The goal, when it came in the 54th minute, was bit of an anti-climax after all the hard work in defence. Koscielny went to duel for a long ball but it skimmed of his head. Vermaelen was well positioned behind him and should have dealt with it. Instead he made the wrong choice and played it towards Mertesacker. The header lacked pace and Albrighton was able to sneak in between the two before slotting through the legs of Szczesny. Vermaelen should either have headed the ball forward or out on the left. That would have given Arsenal enough time to regain the defensive shape. By playing it towards the German without any pace on it, he virtually gifted the chance to the Villa winger. Mertesacker was in a very risky position as a challenge could have led to a straight red or, at the very least, a second yellow. Szczesny again conceded between his legs. That is a technical weakness in his style that I have pointed out before. Someone in the coaching staff will have to identify it and work on it. A minute later Walcott was running into the Villa box and won a corner from a sliding tackle by Dunne. Mertesacker forced a save from the resulting set-piece as he pounced on a loose ball. For a while the game was about all the corners that Arsenal were winning and the crosses that Villa were getting into the box from wide areas. Both sides failed to seriously test the Keeper. Arsene introduced Rosicky for Frimpong in the 65th minute. Little Mozart brought better movement and passing to the field an linked up well with the attackers. Arshavin and Benayoun came on for Gervinho and Ramsey with just around 10 minutes left. Arsenal were able to sustain a spell of pressure. First it was Rosicky who had a shot blocked for a corner. Then it was Arshavin. Arsenal finally got the winner from one such corner after Benayoun was afforded a free header in the six-yard box. The Israeli did well to keep his eye on the ball and placed it well between the Keeper and the man on the post. Arsenal held on to the ball and defended the lead relatively easily as Villa still couldn’t produce anything except more crosses into the box. An astute observer might say they lacked a plan B. This was a game that could easily have been lost but the players deserve credit for fighting and winning. It was far from ideal but the circumstances weren’t favouring the Gunners either. The problems with the defending the flanks are a matter for another day. I enjoyed these tweets from the players at the end of the game. Shows they have a great spirit and know what’s going on. Important win I’m so happy finally to score in the league after long time..this goal is for thomas vermaelen!! Great win today! I wasn t easy. Thanks to @YossiBenayoun15!! U saved me today mate! Szczesny: Did well to hold on to the crosses under pressure. Some of his distribution was rushed and can do with more composure, especially when the team is under pressure. Should work on his technique to avoid leaving such a big gap between his legs. Coquelin: Struggled against the skills of N’Zogbia, which is understandable. Positioning was decent, tenacity heart-warming. Wasn’t able to help in bringing the ball out as much as regular full-backs would have done. Only attempted 27 passes when all other defenders managed more than double that. 6/9 in tackles, 15/22 in ground duels, and 2/2 in aerial duels. Mertesacker: I don’t blame him at all for the goal. Had a very good game in the box and read dangerous situations intelligently. Made the most interceptions – 4. Won a lot of high balls around the centre of the pitch. Koscielny: Superb game in and around the box. Got in the way of a number of crosses. Joint most touches and was composed on the ball. 2/3 in tackles, 7/9 in ground duels, 4/6 in aerial duels. Vermaelen: Very bad decision and weak header for the goal. Very good game apart from that. 2/2 tackles, 6/8 in GD, 2/2 in AD. Sometimes shows his lack of understanding of the role and can’t contribute as much in attack but that’s a problem due to lack of experience in the position. The defence was under pressure in this game as the cover for them wasn’t as good. Moreover, Coquelin was out of position and against a very tricky player. Vermaelen too wasn’t always certain with his positioning/decision making on the wing. It’s good to see the team can work hard defensively despite the issues. Frimpong: Wasn’t able to receive, hold, or pass the ball under pressure. Many of his touches/passes were either heavy or hesitant. Positioning was poor. Seemed really out of his depth in this game. Ramsey: As he said himself and I noted in the two attacking instances above, Ramsey was disappointing. But I also got the feeling he was doing the work of a player and half due to Frimpong’s weaknesses and Arsenal’s difficulty in bringing the ball forward. Was 1/8 in ground duels, has to do much better there. Arteta: Another massive game and another MotM I’d say. Made the most passes with the highest accuracy and joint highest touches. Was always there to support the defence and was instrumental in sustaining possession at key moments. Song absence had a noticeable impact. Frimpong just didn’t get into the kind of defensive positions his senior partner regular gets into. The youngster also wasn’t comfortable under pressure and his decision making wasn’t very good. This meant Ramsey had to move up and down a lot more. Without Arteta in midfield this game could easily have become a repeat of the Olympiacos one. Walcott: Good skill to win the penalty. Also won a number of corners. Had a good chance one-v-one and he took it early. I don’t blame him for missing that but taking it around is also an option. Sometimes I feel he’s too focussed on early shots/crosses. RvP: Composed and well-directed penalty. Excellent work rate and created the most number of chances. Corner deliveries were good and picked up an assist from one. Gervinho: Wasn’t able to beat Hutton despite a number of chances to run at the defender. 1/5 in dribble attempts. Had very little impact in attack in general. Played parts of the game as an auxiliary left back and deserves credit for the effort put in. Arsenal’s struggles to bring the ball out meant that the wide players didn’t receive as much service as they’d have liked. Wenger wasn’t able to make tactical adjustments to use the pace of his wingers even when Villa were pushing high up. That’s a long standing issue and there are some visible efforts being put in but Arsenal have to learn to use their pace intelligently when a team like Villa is chasing the game. Subs: Rosicky was impressive on the ball and looked lively. His touches and passes oozed class. Benayoun got the all important goal showing classic poacher’s instincts. Arshavin had one good strike on goal and was moving around the pitch as if he wanted to make a difference. Wenger: It’s understandable that a side so severely depleted by injuries will have one or two players out of position and that will result in a few anxious moments. But the manager will have to find a way to cover the weaknesses better and use the strengths more. Right now, when Arsenal can’t bring the ball out as well, they are forced into playing it around at the back. It still adds up to the possession and passing stats but the wide players are taken out of the game and the attacking impetus is non-existent. More pre-determined moves can help in such cases. Bringing Van Persie into midfield and releasing Theo in the centre is also an option. A draw or win for Tottenham against Chelsea will keep Arsenal very close to fourth. Four games in the next 13 days should give Arsenal sufficient opportunity to bounce back from the recent disheartening defeat against the League leaders. Given the state of injuries in defence though, Arsene will have to take things game by game. There isn’t much room left for tinkering, particularly at the back. And without his strongest defence the manager might not feel too confident about giving some of the fringe players a game during the holiday period. At Villa Park, at least two changes will be forced as Djourou and Song will miss out due to injury and suspension. This means either Squillaci or Miquel will have to start in defence. Neither is an ideal option but if the team has to accommodate likely errors, it’d be better to invest in the future and give the youngster a chance to improve. In the midfield, Song’s absence could open the door for Frimpong or Coquelin. I can’t see the likes of Benayoun or Rosicky perform the Cameroonian’s role effectively. But Wenger could go for one of the experienced players if he feels confident that Arteta and Ramsey can share the defensive burden. Szczesny – Koscielny, Mertesacker, Vermaelen, Miquel – Coquelin, Ramsey, Arteta – Walcott, RvP, Gervinho. I have gone for Coquelin as he seems to have better technical abilities. So far he hasn’t really had a chance with most of the first team and I want to see how he does with some quality players around him. Arsene could pick Frimpong if he thinks the side is losing some physicality with the loss of Djourou and Song. With Heskey joining Bent on the sidelines, Villa’s attack should be about the pace of Agbonlahor and N’Zogbia. Coquelin’s game intelligence can also come in handy to thwart counter-attacking opportunities. Watch out for a number of long balls down the channels. But the Frenchman might not be that useful in defending set-pieces, the hosts’ other major attacking threat. McLeish created a very strong defensive unit at Birmingham that was tough to beat at their home. So far he hasn’t been able to recreate the same at Villa. Dunne and Collins are what I consider typical British style defenders – big, lumbering, slow, and heavily reliant on tackling and physicality. Along with Hutton and Warnock, this is not a defence that should keep Arsenal out. I believe this game is tailor-made for Gervinho to shine but the Ivorian will have to do much better with his final ball and finishing. If the Scottish manager does revert to type, I am worried Arsenal could return from this trip further depleted by injuries. His Birmingham side wasn’t shy of kicking players on and off the ball, and with the likes of Hutton at his disposal, McLeish could set his side up to beat Arsenal, literally. The tempo of this game will have an impact on the result. Arsenal will win it with relative ease if they can move the ball at the speed we saw in the previous game. But if we get one of those “lacked sharpness” days, Villa will be able to control the game defensively and get more bodies forward in attack. It will make the game a more even contest, in which case the hosts can steal a point or three. A lot of fans believe this particular Arsenal side is mentally stronger and will bounce back from the defeat instead of getting caught up in a negative spiral as some of the recent units have done. They don’t really have much room for slip-ups as a couple of bad results during the Christmas period could see the Gunners drop down to sixth or seventh, if not worse. On the other hand, a strong run could put Arsenal back in the top four if Chelsea don’t get a grip on their erratic form. Let’s see which Arsenal side turns up at Villa Park. In many ways this game was a microcosm of many recent Arsenal seasons. There was much to admire. There were a lot of exciting moments, the club matched the leading club toe-to-toe for large parts and it would be hard to pick one side over the other. The defenders worked hard, certainly considering the free-scoring nature of the opposition. But ultimately, there were key mistakes at the back – in part resulting from unfortunate injuries – and when you look back, the Gunners had nought to show for all the effort and quality. To me that summarizes most of the ups and downs Gooners have been experiencing over the years. Tactically, this was a predictably tight game. Both sides were probing away at every opportunity but there were few clear cut chances in the first half. City were causing trouble with their movement but they either lacked the final ball or Arsenal put enough pressure on the shot. Szczesny only had one really big save that was forced by a wonderful piece of skill by Balotelli. At the other end, I thought Arsenal really struggled with their pre-assist pass. Walcott was getting into excellent spaces but the ball in-behind wasn’t played at the right time or never came at all. Gervinho did see a lot of the ball and space as Silva was on his flank but he couldn’t really create. Arsenal’s best chance of the first half fell inadvertently to Ramsey after a Van Persie strike fell in his path. This move was created by a superb run out from the back by Koscielny that caught City unawares. Persie had an easy ball to put Gervinho behind in a wide position with Ramsey and Koscielny charging into the box. But De Kapitein went for a shot that was partially blocked by a defender. Ramsey was probably taken by surprise and his touch wasn’t very good. Toure was able to get a tackle in before Hart pounced on the loose ball. The first half was a story of both sides having one big opportunity and a number of other highlights worthy moments. But on the whole the two defences were quite firm – although Arsenal’s style has an air of desperation about it at times – and the game was a tactical and technical battle in the congested midfield. Early in the second half Arsenal had another defensive injury. Djourou was taken off and Miquel came on at left back. This forced Koscielny to the right and Vermaelen into the centre of defence. The goal came eight minutes into the half after a counter-attack that resulted from one of the few poor passes from Gervinho. Arsenal’s defensive shape was poor and it allowed Nasri to pass it wide for Balotelli without any pressure on the pass or the run. The Gunners have been chasing hard in defence and got seven bodies back into the box. The Italian striker was able to get his shot away after shrugging off the attentions of Song. Szczesny could only palm it back into the centre of the six yard box. Arsenal had four defensive players around two relatively short attackers – Aguero and Silva. But it was ultimately a City player who got the vital touch with Silva tapping in, almost unchallenged. If anyone wanted to play the blame game it would be easy to take one’s pick from a number of culprits. Gervinho’s pass was easily read and intercepted. Koscielny was nowhere near Balotelli who’d moved wide. Song could have put a better challenge to block the shot or forced Balotelli to his weaker foot. Szczesny – well I just imagine how fans would have reacted if that had been Almunia. Miquel was in a very poor position. Vermaelen just got caught between Aguero and Silva. Nit-picking is easy but I am not a big fan of criticising individuals harshly. There are basic problems at the back for Arsenal and the defence-by-crowd tactic will occasionally lead to such moments against a quality attack. It became a completely different game after the goal. Arsenal really went for it with Walcott rasping the gloves of the Keeper within a minute of going behind. Then Van Persie put the ball in the net but was just off-side. At the other end City got a lot more space to run into but couldn’t add to their lead because of poor final ball (Nasri in particular), unlucky strikes (hit the post or just wide), and last gasp defending. Arsenal had a number of good chances. Gervinho for once did produce a burst of speed to get past Richards and delivered a quality pass. Van Persie was able to direct it towards goal but couldn’t generate any power. He was probably rushed by the lunging defender. Vermaelen went close with two efforts from distance late in the game. There was also a penalty shout against Richards for handball. I have seen those given but, in fairness, would have been very disappointed if it was given at the other end. I haven’t seen any replays but it looked to have come off the head of a player just a couple of yards away and probably took the full-back by surprise. At this level the margins are very small but once again Arsenal were on the short end. Szczesny: Came out well when he had to, made a big save and a number of routine ones. For the goal, just ask yourself how Almunia or Fabianski would have been treated for palming the ball back into such a dangerous area. Djourou: He was doing a decent job on the right in a nondescript sort of a way. It wasn’t about great tackles or scintillating attacking runs but his positioning was good and wasn’t letting much happen on the right. Mertesacker: His pace was a handicap for the side and allowed the hosts to get in behind on occasion as the German dropped back to make up for his lack of speed. Did get into very good positions and again got some crucial touches in and around the box. Koscielny: Had a good game in the centre and adapted well when shifted to the right. His run down the middle to set up Arsenal’s best chance was excellent. Won a number of duels but his positioning can be questioned for the goal as it was neither here nor there. Vermaelen: Wasn’t getting forward as often as regular full-backs do but had a strong game at left-back and in the centre. Had good success in individual duels and tackles while also making the joint highest interceptions – 6. Shots at the end were very good but not effective. A close second for MotM in my reckoning. Miquel: Looked a bit nervy early on. Made a very good tackle on Silva inside the box. Positioning for the goal was suspect at best. Tough game for the youngster but Arsene might need more from him if the injury situation doesn’t improve considerably. Given the basic issues in defence, I was happy with the effort of the defenders. They didn’t allow too many clear strikes on goal, and did much better than other defences in England have against this attack, but in such games one is often enough. Song: Had an erratic game. Was cautioned early on and some would consider him lucky to be on the pitch at the end. I thought the ref handled his indiscretions/mistimed tackles well. Showed a lot of strength on occasions and did a great deal of chasing to help the defence. But duelling rate was poor and lost many individual battles. Arteta: MotM in my opinion. Handled the pressure intelligently and kept the game ticking, easily making the most passes. Won back possession more often than the others and also had the joint highest interceptions. Ramsey: I don’t want to be harsh but his performance was the most disappointing. Couldn’t beat opponents in physical battles or for pace. Squandered the best chance although, in fairness, it happened too fast. Was slow on the ball and missed a number of pre-assist opportunities. I thought Arsenal’s advantage in midfield was negated by Ramsey’s performance or lack of it. Song and Arteta worked had in defence and in attack but weren’t able to make an impact in the final third. Read somewhere that the dynamic duo will now be suspended for the Villa game but not sure about the details. Walcott: Was largely anonymous but that was partly due to a lack of service. He was also isolated to an extent as most of Arsenal’s play was building down the left. Theo often got a ball only when he was in a crowd. Had a relatively better second half. Saw more of the ball and produced a thunderous strike. RvP: Wasn’t as good when judged by his exceptional standards but it was another hard working effort from De Kapitein. Decision making on the ball was slow/poor when he dropped deep. Probably didn’t see some of the runs that Walcott was making. Gervinho: Had the best pass accuracy but at least two of his three misplaced passes led to counter-attacks including the goal. Was often indecisive when in space. Apart from Ramsey, he was the second most disappointing player on the pitch for Arsenal. Did create one excellent chance but much more was needed as he saw so much of the ball. The attacking players got a fair bit of space but Arsenal seemed to lack the level of understanding needed to create and finish chances at this extraordinary tempo. A degree of functionality might have helped as too often the Gunners ran out of ideas when they got to the penalty box. This forced them to pause for a thought and it was enough for the hosts to get their defensive shape and bodies back. Subs: A number of Arshavin’s touches were just awful and I say that as fan who tries to find positives. The ball was rarely played in the vicinity of Chamakh. To an extent Arsenal lacked quality on the bench as I don’t believe Benayoun or Park would have offered much more. Arsenal could have been within six points of the top but as things stand they are closer to Stoke in 8th than Tottenham in 3rd. The top two are virtually out of sight. The thing with such a poor start is that even when the leaders drop a few points it will be hard to catch up because the Gunners are going to have some tough games like this one. It was a respectable effort but a result that puts Arsenal in a spot of bother with only fourth appearing as a possible target. You are currently browsing the Desi Gunner blog archives for December, 2011.